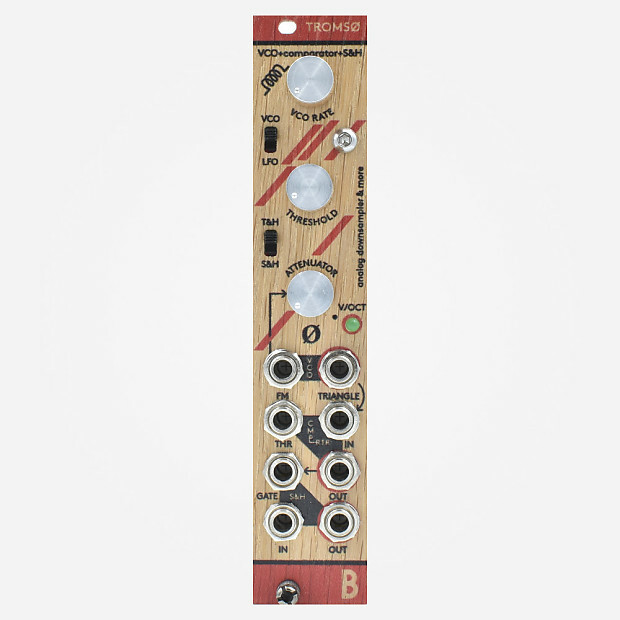 Tromsø is a combination of 3 basic utility modules: VCO, Comparator and Sample & Hold. Internal normalisation allows you to instantly use it as voltage controllable analog downsampler (or sample rate reducer if you like). The sample rate is set by VCO Rate and a sort of “dry/wet” mix effect which is achieved by adjusting the Threshold when in the Track & Hold mode. This architecture was inspired by a machine called Distortotron made in 1994 – arguably the first analog downsampler and bit distortion of its kind. That machine came from a collaboration between Norwegian musician Mental Overdrive based in Tromsø and the inventor group Psybe (Svein Berge and Henrik Sundt). It was created from a need to bring back oldschool sampler aliasing and lo-fi effects and heavily influenced the sound of album Plugged which is the landmark of the so called Tromsø sound. The VCO of Tromsø module can track one volt per octave when the Attenuator on the FM input is fully open which makes it possible to have the downsampling effect track with the pitch of a played note. All 3 utility modules of Tromsø can also be used completely independently because the normalisation disappears once you plug a connector into the inputs. I will ship with tracking to the listed regions. To negotiate shipping rates to other locations, please send me a message. This product can be returned within 14 days of receipt. Items must be returned in original, as-shipped condition with all original packaging and no signs of use. Buyer assumes responsibility for all return shipping costs unless the item was not received as described. Buyer receives a full refund in their original payment method less any shipping costs and a 15% restocking fee. "New/Mint" condition items returned (excluding defective items or items not as described) will be inspected and tested upon return to the shop, and if they are not returned in New/Mint condition (due to broken seals on packaging or minor signs of use like rack rash or scratches) and are no longer able to be sold as "New/Mint" a fee will be assessed for the difference between it's new price to it's estimated resale value, up to a maximum of 15% plus shipping costs. Please confirm your email before sending messages.